Whether you are raising capital or investing in I.T. – I just thought I’d share a few high-level thoughts based upon lessons learned over the past 18 months! First, early valuations are based upon Best Guesses! When I first started Xcelocloud, transparently, I believed it would take approximately $1.25MM to build out a national footprint and begin to differentiate us in the marketplace. So, based upon my experience and a business plan, I sought the advice of industry executives, successful entrepreneurs, VC leaders and PE relationships and concluded a value… After the first 30% of the capital coming in, we got busy with the new business and then found “deals” for capital began to get more challenging… we’ve continued to raise capital but have had to become more flexible with valuations to drive funding! Now we are in the midst of our last $500K Raise Campaign – and have pushed ego’s (aka “valuations”) to the side in order to complete the foundation we, and every company, needs to succeed! Next, if you are a founder – don’t stop raising capital when you get to 30-50% of your stated goal – keep going!!! If you are an investor – encourage the founder to press on, help her or him set appointments with your friends that might be open to investing… Remember, everyone’s money is safer when a company is fully or amply funded! My lesson learned is that as much as I LOVE growing the business, driving revenues, creating new solutions and building a team – and as much as I am challenged by talking to people about money – my JOB is to set the foundation for success for Xcelocloud in EVERY way… and funding is the most foundational portion of almost any business! My #1 Priority for this month and next is now to COMPLETE THE FUNDING CAMPAIGN! Lastly, stay tenacious and humble at the same time! One mistake I made was believing everyone when they told me, “Hey, sounds great – I will have a wire to you by Friday!” … or “I will take a bigger piece next quarter.” Until the money is wired – find 3 to 5 more backups for funding… this will help ensure you get to the finish line faster and relieve stress for the founder and his/her investors! Lol! At the same time, just because your business is going to be worth $30M – $50M – $100M – $1B —- does not mean that it is worth X today… Be humble enough to lower your percentage to drive investment! A wise founder of a really successful tech company recently told me, “Having a solid slice of a watermelon is better than having half a lime!” Ironically, I expect them to go public or be acquired for a sick multiple – in large part because of his leadership (and the team he put around him – with ample funding!). 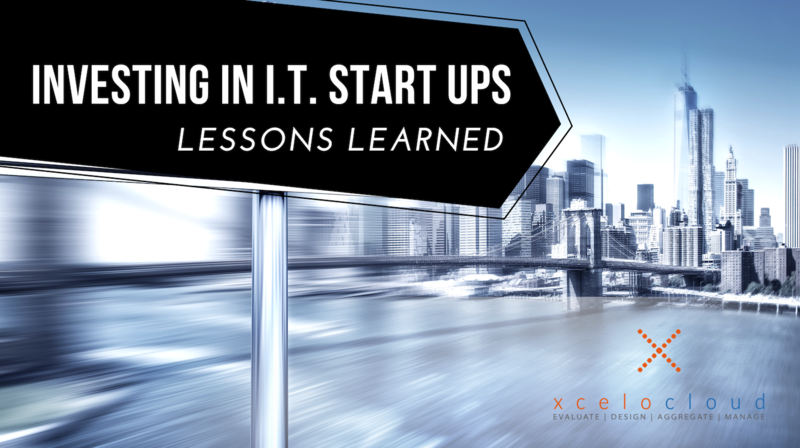 There are many more lessons learned I’m sure, but if founders and investors can create win-wins – your company or investment in I.T. Start-Ups can derive multiples that will help all parties smile all the way to the bank! For more information, or to consider an investment in Xcelocloud, please feel free to DM Mike Champion!